Before Garret Ghostfighter mentored Jacob, his protege, there was the case that first led to their unique bond... Garret is summoned to an excavation site by his friend Colonel McGrove. After unearthing an ancient stone, a scientist vanished and the camp experienced many inexplicable catastrophes. With the rest of the workers abandoning the camp, only McGrove remains with the hope that Garret can locate the scientist, and his only son Jacob who was stolen in the night by something evil. Jump into the role of Garret Ghostfighter once again and explore the grounds around the encampment to rescue the missing. Locate important items that will aid in your search, solve vexing puzzles, and expose the creature that is the cause of all these ills. How will Garret stop this evil before it spreads to other parts of the land? Find out when you download free full version of Inception of Darkness - Exorcist 3. 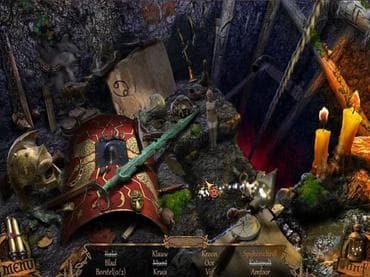 Free Game features: - Exorcize a malevolent force to save a child in this Hidden Object investigation; - Explore archaeological grounds to uncover facts and locate important clues; - Search for helpful items to solve vexing puzzles; - Stop the darkness before it spreads to other areas; - This game is intended for mature audiences. If you have questions about Exorcist 3: Inception of Darkness game, please contact us using this form.